2013 was a very successful year for ART IN THE PARK. Let us continue supporting our talented artists. Saturday Jan 11 will be this year's first ART IN THE PARK. Here is the new calendar of events. 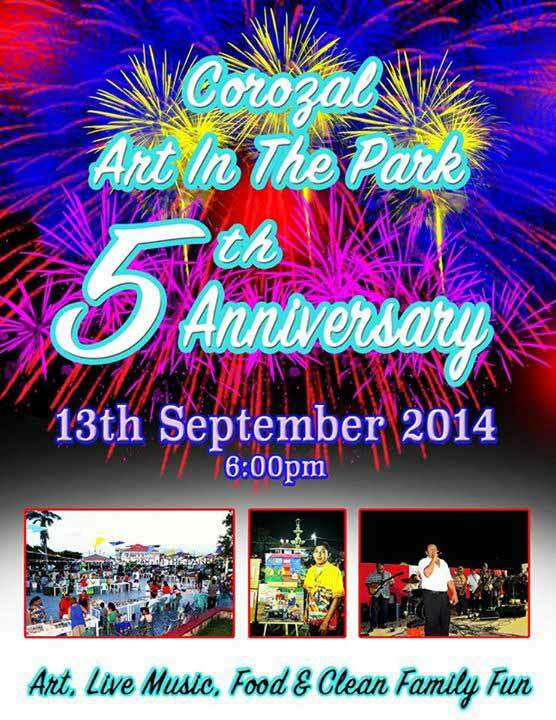 5th Anniversary Corozal Art In the Park will be the best ever! Art in the Park began in 2009 as the brainchild of Debra Wilkes, who still spearheads this project. 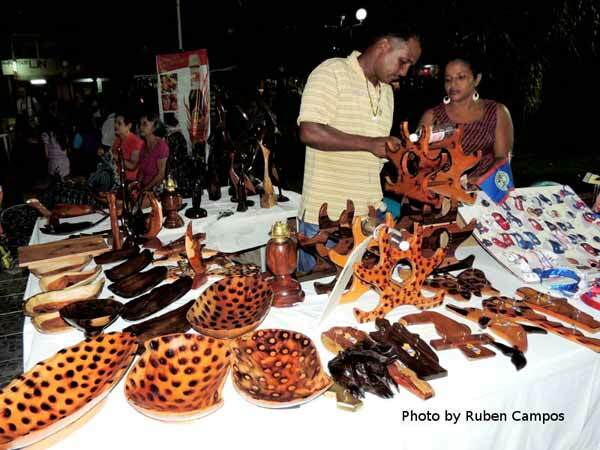 It functions under the auspices of COLCHA, which is is a Corozal entity dedicated to "Celebrating, promoting, and preserving the cultural heritage, art and history of our community as we identify our nich within the tapestry of National Belizean Identity." (From the Mission statement) For the Fifth Anniversary Celebration music was provided by the very popular Corozal musical group Caribbean Roots. Artisans displayed around the fountain, and the walkways to the streets in Central Park were filled with a wide variety of food vendors. There were hundreds and hundreds of folks present for this event! The program for the night consisted of the recognition of a number of artists who have been loyal and are almost always present for the monthly Art in the Park. Also recognized were a number of groups that have been physically and financially supportive. These artists and groups are found in the gallery of pictures below. The climax of the evening was a short display of impressive fireworks! For lots of photos click here! 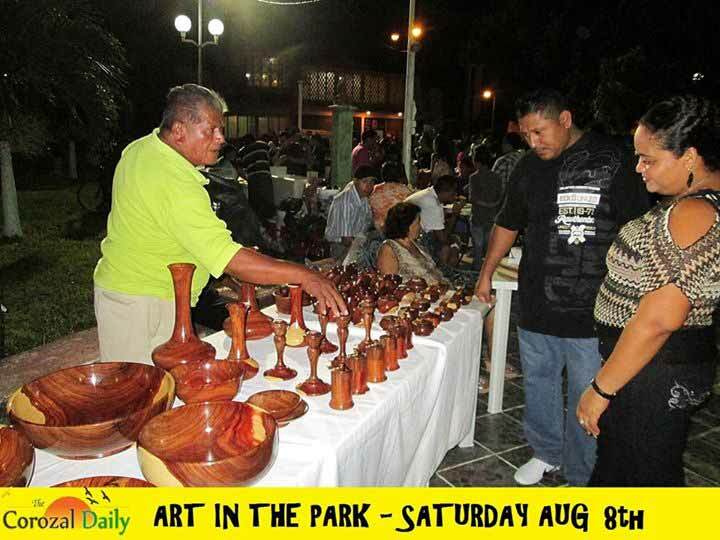 The Corozal Organization Leading Cultural Heritage and Art (COLCHA) is inviting all to our Christmas Edition of Art in the Park this Saturday December 13th. The event begins at 5:00 p.m. and at 7:00 p.m. we will be presenting a musical group from Chetumal; Cuerteto Juul K'iin; they along with their dancers will present traditional romantic spanish music. Come out and enjoy! 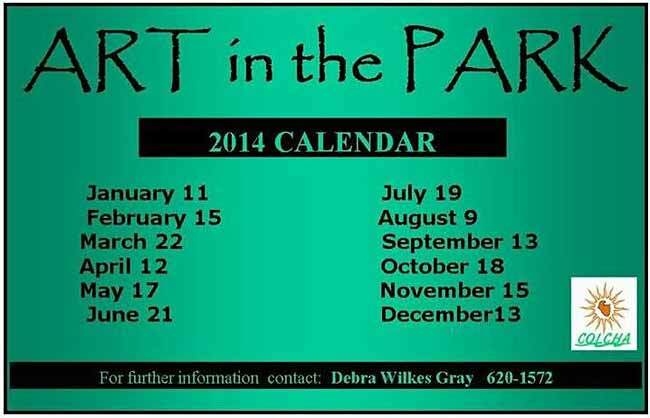 ART in the Park 2015 Calendar. 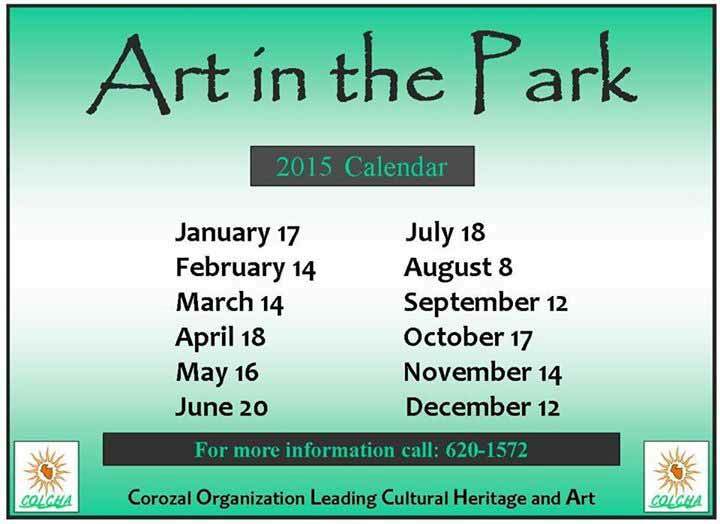 Another exiting year of more Art in the Park projects and programs by COLCHA. Happy New Year and continued success to all the organizers. Big-up! 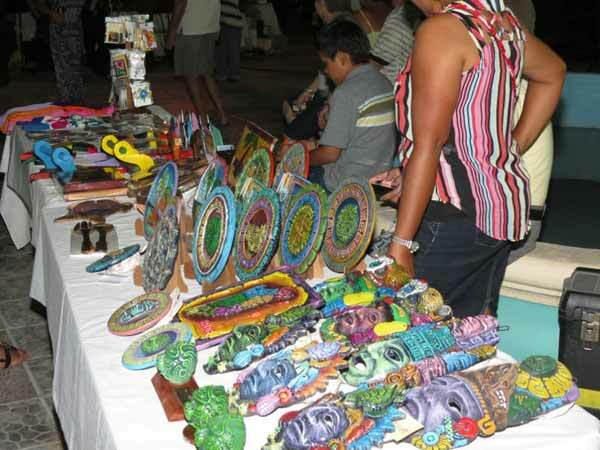 Bring out the entire family this weekend at the Corozal Central Park. It all starts at around 6:00 p.m. this Saturday August 8th. 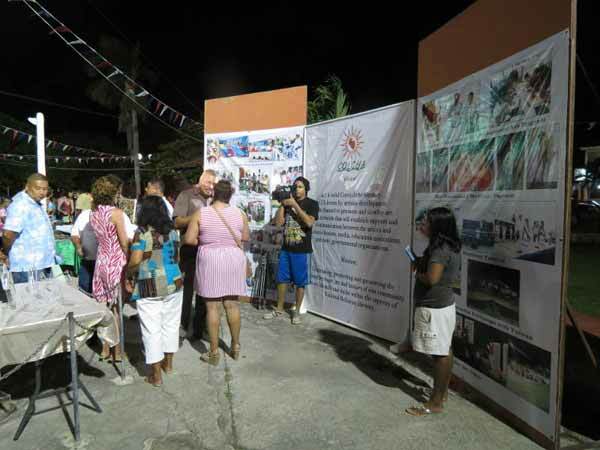 Here is a great time to meet old friends and reminisce on the good old times in Corozal, while treating yourself to a wonderful piece of art work. Food, music and ART. Our monthly Art in the Park event scheduled for Saturday October 16th, 2015 has been postponed to Saturday October 24th, 2015 due to inclement weather. Our apologies for any inconveiences caused. 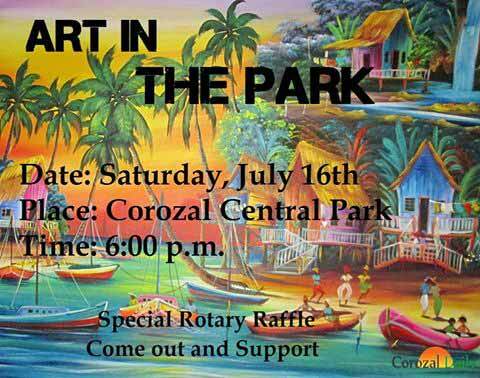 Special Raffle by the Corozal Rotary Club - All for a good cause. See you there! 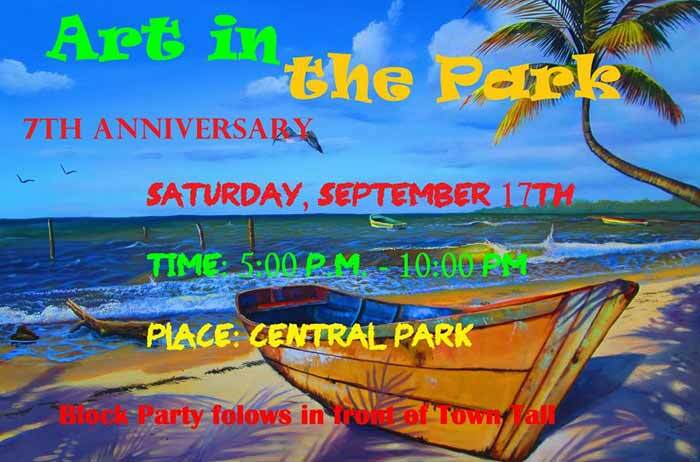 Art in the Park today- 7th Anniversary - Block Party Follows!